I may have mentioned in passing that Mrs G and I occasionally buy a newspaper which has a title like the Daily Fail. We only buy it on a Saturday. For the TV guide, you understand. I occasionally glance through this glorified holiday brochure that is laughingly called a newspaper. It is full of the most hate-fuelled bile that I have ever had the misfortune to read. An article on a popular actress, say, might have the headline ‘She was a talented actress with a successful career and a loving husband’ then in goes the knife... ‘So why did she throw it all away for a drug-fuelled hedonistic lifestyle with a dropout student half her age’. Truth is, she probably didn’t; it is just a typical Daily Pail attention grabbing headline. 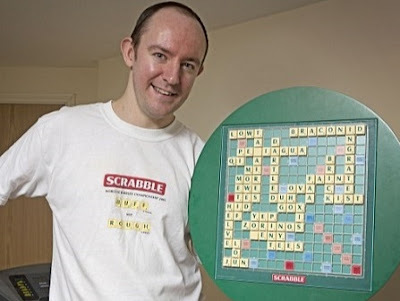 Apparently an ‘organisation’ called the Mindsports Academy wants Scrabble to be classed as a sport. It also wants chess to be given the same treatment. How can playing a board game be classed as a sport? It isn’t a sport; it is a pastime. Ah, you may counter, isn’t that how all sports emerged? Surely, all sports began as just a bit of playful fun; a game. Indeed they did and don’t call me Shirley. But sport isn’t about mental ability, although that is necessary, it is far more about physical skill. I can’t think of any recognised sport that relies solely on mental capacity. So, what other ‘games’ might be reclassified as sports? Draughts? Dominoes? Ludo? Snakes and ladders? Mon-fn-opoly? What about Kerplunk? Is it any dafter a suggestion? If the Mindsports Academy feels so strongly about this, may I suggest they follow the route taken by disabled athletes and begin their own olympic games? They could give it a silly combination word like they did with paralympics. Mentalympics? Boredolympics? Sorry, meant boardolympics. Incidentally, in the past there have been some really daft ‘sports’ at the olympics. Over the years, demonstration sports have included angling, cannon-shooting, firefighting, kite-flying, motorsport and pigeon racing. Between 1912 and 1948 there was even an art competition. Honestly. Painting. How can that ever be classed as a sport? Also, how can boxing be called a sport? Two numpties knocking lumps out of each other is not sport; it’s assault. If they tried it anywhere else they would get arrested. How many boxers end up brain-damaged thanks to injuries sustained in the ring? Ban it, I say. Then there is synchronised swimming. Why is that considered a sport? Yes, it is very clever being able to float and sink in time to music, but it’s not sport; it’s an Esther Williams musical. I am sure I could come up with better ideas for sports. Bubbles. Sorry pardon excuse me? Bubbles. Who can blow the biggest bubble. Indeed, there are two ‘sports’ there... Soap and bubble gum. Hoovering. There’s another one. Who can clean up a given amount of dust using identical vacuum cleaners. Wallpaper hanging. Sending text messages. Throwing a dirty paper hanky into a wastepaper bin. Loads of things could be done competetively in the name of sport. Hmm... Maybe making Scrabble a sport isn’t so silly a notion, after all. Were any famous or notorious people born on the 18th of February? Of course. Here are some I’ve even heard of. Mary I of England 1516 (The one the drink is named after. ), Alessandro Volta 1745 (Inventor of the battery and discoverer of methane. Not quite sure how he discovered methane, but I could make a guess. I wonder if he set fire to them. ), Ernst Mach 1838 (Physicist. Him they named the speed after. ), Adolphe Menjou 1890 (Murcan actor. Had a film career lasting from 1914 to 1960. One of the few stars to make a seamless transition from silents to talkies. ), Hans Asperger 1906 (Paediatrician. He identified the ‘autistic spectrum’. Had a syndrome named after him. ), Phyllis Calvert 1915 (Jobbing ectress. Had a film career lasting from 1927 to 1997. Ha! Take that, Menjou! ), Jack Palance 1919 (The Meanest Guy That Ever Lived. ), Alan Melvin 1923 (Murcan actor and voice man. Played Corporal Henshaw in the Phil Silvers Show and voiced Magilla Gorilla and Banana Split Drooper. ), George Kennedy 1925 (Another Murcan actor. He was also in the Phil Silvers Show. ), Len Deighton 1929 (Orfer. Created the Harry Palmer character played in the films by Michael Caine. Not a lot of people know that. ), Milos Forman 1932 (Czech film director, screenwriter, actor and professor. In fact, a right old smarty boots. ), Yoko Ono 1933 (‘If her singing voice was a fight, they’d stop it in the first round.’), Bobby Robson 1933 (Revered foo’y manager. ), Mary Ure 1933 (Ectress. Went to school with Wendy Craig, you know. ), Francisco Rabaneda Cuervo 1934 (Who? More commonly known by his pseudonym Paco Rabane. ), Graham Garden 1943 (A Goodie. Also plays Hamish in You’ll Have Had Your Tea, which was a spinoff programme from two characters Garden and Barry Cryer came up with on I’m Sorry I Haven’t A Clue when they were playing ‘sound charades’. Here’s a wee link. Quite apt this week. ), Michael Buerk 1946 (Rhyming slang. ), Sinead Cusack 1948 (Ectress. Sister of Niamh, Sorcha and Padraig. I wonder where they come from. ), John Hughes 1950 (Film director responsible for some of the nineteen-eighties’ most popular comedy films. ), Cybill Shepherd 1950 (Murcan actress. Trivia: she wanted Harley Venton to co-star in Moonlighting. His loss was our... loss as well, because we got saddled with Bruce Willis. ), John Travolta 1954 (Murcan actor. Big fan of James Cagney. ), Greta Scatcchi 1960 (Ectress. Trivia: fluent in English, Italian, French and German. ), Rob Andrew 1963 (Ruggery bloke [You’re not a very good ventriloquist... oh, I see... ruggery... as in rugby. He’s not rubbery, then. - Ed. ], Matt Dillon 1964 (Murcan actor. Never appeared in Gunsmoke. ), Andre Young 1965 (Who? Better known as rapper and record producer Dr Dre. ), Roberto Baggio 1967 (Italian footy bloke. Don’t mention that penalty. ), Colin Jackson 1967 (Welsh runny jumpy bloke. ), Molly Ringwald 1968 (‘I’ve been called the Women’s Auxiliary of the Brat Pack.’), Radek Cerny 1974 (Czech footy bloke. ), Gary Neville 1975 (Another footy bloke. Phil’s brother. ), Ivan Sproule 1981 (Oirish footy bloke.) and Jermaine Jenas 1983 (Yet another footy bloke.). Emyr Huws [I wonder where he comes from. - Ed.] scored a late winning goal for Ipswich Town when he turned home David McGoldrick's cross for his first goal for Town. Huws' effort came moments after McGoldrick had cleared a header from Villa forward Scott Hogan off the line. Birkir Bjarnason had earlier gone even closer for Villa, hitting the bar. Darren Bent's second-half double earned Derby County an unlikely point as they came back from 3-0 down in an astonishing game against Bristol City. Matty Taylor netted on his full debut and Tammy Abraham scored twice from close range as the Robins dominated an abject home side in the first half. Headers from Bent and Tom Ince, though, set up a thrilling finale. Bent's penalty, after Scott Golbourne fouled Ince, denied City a third away league win of the season. After Greg Halford had failed to head in Craig Noone's first-half free-kick, Sean Morrison converted a similar set-piece from Noone for the Bluebirds' opener. Kenneth Zohore fired in a second following Aron Gunnarsson's break, to settle it. Leeds failed to trouble keeper Allan McGregor, and had Liam Bridcutt sent off for two bookings. Three goals in eight first-half minutes inspired Norwich to a commanding win over Nottingham Forest at Carrow Road. Jonny Howson's 25-yard volley put City ahead and was followed by Josh Murphy's finish from a tight angle and Wes Hoolahan's half-volley from distance. Alex Pritchard's low drive made it 4-0 before Forest defender Eric Lichaj was sent off for two yellow cards. Ross McCormack stroked in a consolation on his debut for the visitors before Pritchard drilled in his second. Marc Roberts headed just wide for the visitors in a below-par first half, and Tom Bradshaw volleyed inches over shortly after the re-start. The Royals responded as Yann Kermogant forced a good, low save from Adam Davies and Garath McCleary went close. But it was Barnsley who came closest to a winner as forward Marley Watkins struck the base of the post. Hmm. A bit too whopping for my liking. Teaser time. Yay! Last week I asked you which England player has made the most appearances in the World Cup finals competition. The answer was, of course, Peter Shilton. He made 17 appearances in three World Cups - 1982, 1996 and 1990. Quite an achievement considering he was 32 when he played in his first. One for this week? Let’s stick with goalkeepers, shall we? Since the inception of the English Premiershit, which goalkeeper has kept the most Premier League clean sheets? Hmm... One to ask them down the pub. "Manchester United dropped points, Liverpool dropped points, Chelsea dropped points, Everton dropped points, so in a way we haven't lost anything at all really, although we dropped all three." "I'm not going to look beyond the semi-final - but I would love to lead Newcastle out at the final." "He never fails to hit the target. But that was a miss." "Eighteen months ago Sweden were arguably one of the best three teams in Europe, and that would include Germany, Holland, Russia and anybody else if you like." "We can't replace Gary Speed. Where do you get an experienced player like him with a left foot and a head?" "Gary Speed has never played better, never looked fitter, never been older." "People want success. It's like coffee, they want instant." "One day, someone will end a football game scoring more than Brazil. This might be the time that they lose." "Denis Law once kicked me at Wembley in front of the Queen in an international. I mean, no man is entitled to do that, really." "Home advantage gives you an advantage." "Look at those olive trees! They're 200 years old - from before the time of Christ." “Hitler didn't tell us when he was going to send over those doodlebugs, did he?” (On why he refused to name his England team before a World Cup qualifer against Sweden in 1989).